First of all, look at this lineup of talent we have in store for you: Deanne Smith, Nigel Grinstead, Chanty Marostica, Todd Graham, Rob Pue, Aisha Brown, and Ali Hassan. 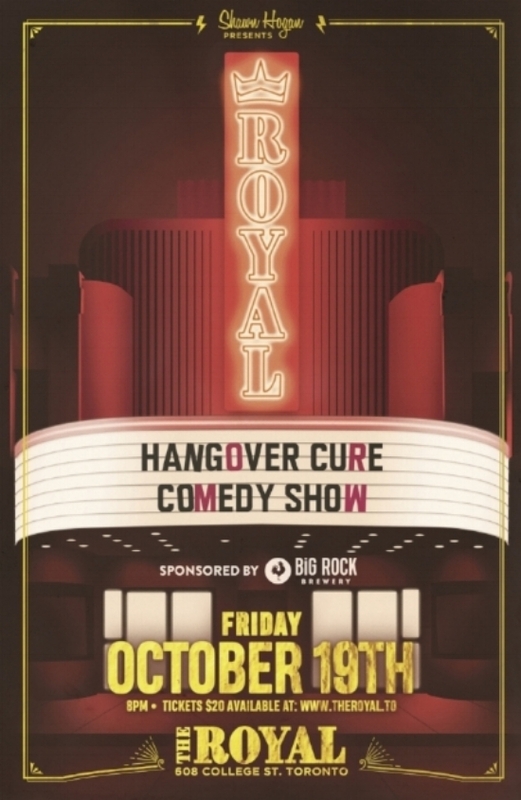 For six years the Hangover Cure Comedy Show has brought some of the most talented comedians in Canada to perform on a hidden patio tucked away behind College street’s Cloak & Dagger Pub. Performing under an overhanging plum tree, on a 4x6 wooden stage, without a microphone, in front of 65 devoted fans of the show, comedians and audience alike have grown to love this intimate setting and all the natural surprises it has to offer. Now, to celebrate the end of our sixth season, we’ve put some of the crowds’ all-time favourite comedians together, on one lineup, for a star-studded show at the famous Royal Cinema. The Hangover Cure Show started six years ago on a rickety slapped-together stage in front of a confused group of strangers, and has since grown into one of the highest quality comedy shows this country has to offer. Every Sunday offers a new, carefully curated line-up of comedians to showcase for an eager audience - filled as often with new faces as familiar ones. The Royal Cinema show is here to celebrate what the show has become, and the many more seasons of quality comedy it plans to bring to Toronto audiences in the coming years. Deanne Smith, Nigel Grinstead, Chanty Marostica, Todd Graham, Rob Pue, Aisha Brown, and Ali Hassan.